Three Houses in Vienna presents an in-depth account of the creation and design of a new housing project in the Austrian capital. The PaN-Wohnpark-project, which consists of three multifamily buildings grouped together, was commissioned by Neues Leben, a private social housing and building cooperative. It is part of a major redevelopment plan for the vast area of a former railway terminus. Each house was designed by a different architectural firm—von Ballmoos Krucker Architekten of Zürich, Werner Neuwirth Architekt of Vienna, and Sergison Bates Architects of London—and each reflects a distinct character and attitude. Yet despite the buildings’ differing colors, materials, and floor plans, they all clearly work as a group and offer their residents an effective combination of public and private spaces. The book explores their creation through essays and images, site and floor plans, elevations and renderings, all lavishly presented. 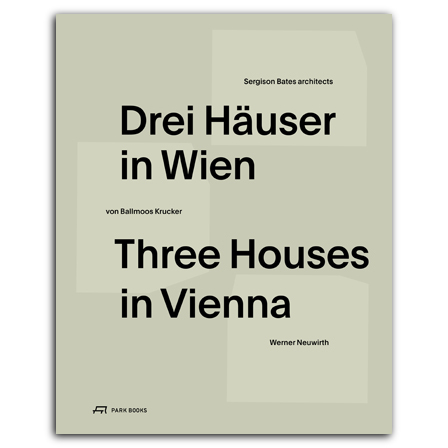 Three Houses in Vienna is among The Best Dutch Book Designs 2014. Designed by Studio Joost Grootens. is a freelance architect and also works as a research and teaching assistant at Vienna University of Technology. He has been working with various architectural firms before, including Carosu St. John Architects in London. , born 1951, graduated in architecture from Vienna’s Academy of Fine Arts. He worked with various architects and taught as a lecturer at the University of Applied Arts until 1989 and since as visiting professor at various international universities. He was director of Architekturzentrum Wien Az W 1993–2016 and also worked as an editor for Domus magazine 1995–99. In 2002 he was commissioner of the Austrian pavilion at the International Architecture Exhibition of the Venice Biennale.